The penultimate weekend of Arena Lacrosse League action brought surprises and upsets. The St. Catharines ShockWave’s 11-game winning streak was finally snapped as they fell to the Six Nations Snipers. The last-place Whitby Steelhawks picked up a much needed win over the Toronto Monarchs, who continue their slide to the bottom of the standings with their fifth-straight loss. And the Peterborough Timbermen’s comeback tour ended at two games as they were unable to get past the Oshawa Outlaws. Every team is in action next weekend as final playoff positioning will be determined. The St. Catharines ShockWave and Peterborough Timbermen have wrapped up first and second place, respectively, but positions three through seven are all still to be decided. The ShockWave, as regular season champions, will have a bye through the quarterfinals. Read on to find out how this past weekend’s games unfolded. The Outlaws led in this game from the moment the ball dropped. Falling behind early wasn’t out of the ordinary for the second place Timbermen, who had to force comebacks in their prior two games. They almost did it again, but a questionable non-reset call with 15 seconds left allowed the Outlaws to hold them off. The Timbermen trailed almost from the get-go, down 1-0 just 1:08 into the game. Clay Arnold quickly tied it up with his first of the season, but the Outlaws outscored the Timbermen 4-1 the rest of the quarter for a 5-2 lead. Peterborough was impressive in the second quarter. Nick Damude held the Outlaws scoreless while Fred Hartley and Mark Vradenburg scored to close the gap to 5-4 at halftime. Each team tallied three times in the third with the Outlaws leading 8-7 heading into the final frame. 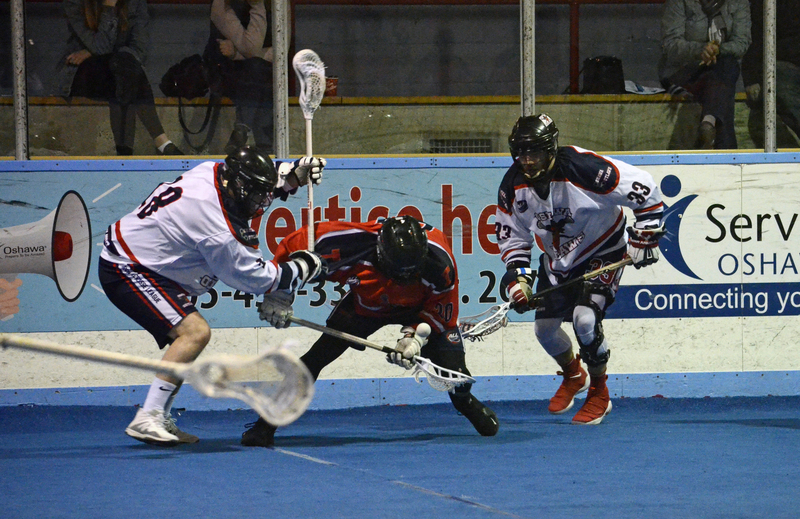 Oshawa scored the first three goals of the fourth, forcing the Timbermen onto their heels. Oshawa played like a desperate team without their top two scorers in Mike Triolo and John St. John. They relied heavily on goaltender Rance Vigneux, who played his best game of the season. The win moves the Outlaws into third place behind the Timbermen. The Monarchs were once contenders for first place in the ALL, but have hit a stumbling block and dropped five in a row, meaning they’re now trying desperately to not finish in last place. The Steelhawks, champions in 2018, have been basement dwellers this whole season. It will be surprising if they don’t finish in seventh place, though they certainly have hope after this weekend’s victory. The Monarchs held the advantage until late in the third quarter. Leading 11-9, Cam Milligan and Garrett Eddy tied things up for Whitby. Pat Corbett gave the Monarchs back a one-goal advantage, but a natural hat trick from Austin Murphy in the last minute reversed things and gave Whitby the 14-12 lead. Toronto tied the game at 14 before Murphy created some more late-period heroics, scoring the winner with 1:07 left in the game. Murphy led with six goals and three assists. Milligan scored four times and assisted on two others. Dan Lomas led Toronto with four goals and five assists, while Tyler Ferreira added four goals and one helper. The ShockWave nearly had a perfect season, falling for the first time in 12 games this past weekend to the Six Nations Snipers, who have been battling with Whitby for last place for most of the season. The ShockWave had only 15 runners and were missing goaltender Gowah Abrams, called up to the Philadelphia Wings. The ShockWave led 3-2 after the first quarter but the Snipers took over from there. Though the ShockWave tied the game four times, the Snipers always came back to lead. A four-goal run in the fourth put the game away. The Snipers were led by Tyler Brown (4G/3A), Skye Sunday (3G/1A) and Justin Martin (3G). Jake Lazore earned the win in goal. Chris Attwood’s three goals and three assists led the ShockWave, who have already locked up first place.